ruthdelacruz | Travel and Lifestyle Blog : Free Ice Cream from Go Nuts Donuts! Free Ice Cream from Go Nuts Donuts! I never know Go Nuts Donuts serves Ice Cream?! But they do! And they are giving away FREE tub of ice cream for the first 2000 Facebook fans and then a FREE double scoop to the succeeding 1000! I am the 292nd fan! More slots for the freebie! Go, hit the button and become a fan! Please do subscribe to my blog so you won't miss out on Freebies alerts! Please click HERE. 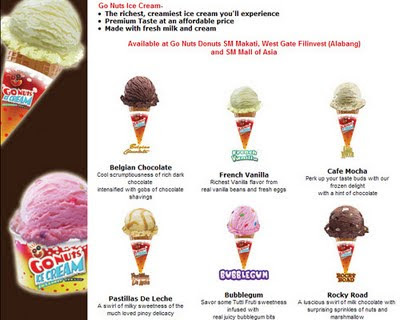 © ruthdelacruz | Travel and Lifestyle Blog : Free Ice Cream from Go Nuts Donuts!